(16957, Alvin Rucker Collection, OHS). (149, W. P. Campbell Collection, OHS). The printing industry in present United States dates from 1639 when Stephen Day published two works at Cambridge, Massachusetts. Oklahoma's printing and publishing industry has its roots at Union Mission, Indian Territory (I.T. ), beginning in 1835 after Rev. Samuel A. Worcester shipped a printing press to I.T. By August 1835 he was printing religious tracts. The first book published in present Oklahoma was a Muskogee-language primer entitled Istutsi in naktsokv, or The Child's Book, printed at Union Mission on August 22, 1835. In June 1837 Worcester moved the press to Park Hill, Cherokee Nation, I.T. Publications from Park Hill were published in the Cherokee, Choctaw, and Muskogee languages. The second printing press established in the Cherokee Nation was the Baptist Mission press, which published the Cherokee Messenger, the state's first periodical. William Potter Ross edited Oklahoma's first newspaper, the Cherokee Advocate issued on September 26, 1844, at Tahlequah, Cherokee Nation, Indian Territory (I.T.). The Indian Journal first published at Muskogee, I.T., in May 1876, remains the longest continuously published newspaper in present Oklahoma. Historians claim that the Ardmoreite, published at Ardmore beginning in 1893, was the first daily newspaper in I.T. When Sidney Suggs became associated with that paper in 1897, he purportedly was the first printer in I.T. to buy a Linotype typesetting machine. Two prominent printing companies in I.T. 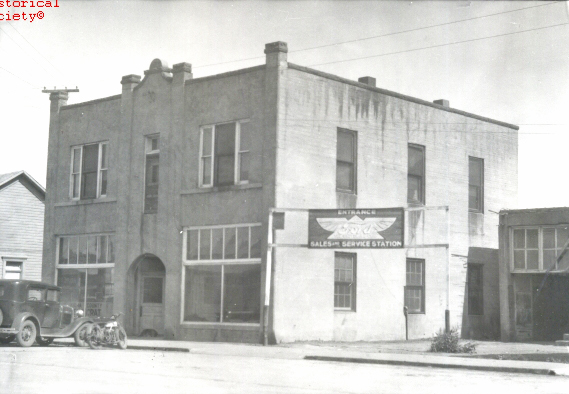 included the International Printing Company, an intertribal cooperative effort begun in 1875, and the Phoenix Printing Company, established at Muskogee in 1888. During the territorial period in the area that became Oklahoma Territory, a number of newspapers were established before the first land opening in 1889. The Cheyenne Transporter printed at Darlington (the Cheyenne and Arapaho Agency) first appeared in December 1879. At least two "boomer" publications promoted the opening of the Unassigned Lands. They included the Oklahoma War Chief and the Oklahoma City Times. The Oklahoma War Chief published at Rock Falls in the Cherokee Outlet in 1884 reported the boomer activities of David L. Payne. Reporter B. R. Harrington, who was familiar with the Unassigned Lands, sent promotional articles from the Oklahoma City railroad depot to Wichita, Kansas, where the weekly Oklahoma City Times was first published on December 28, 1888. Hamlin Whitmore Sawyer, editor and publisher of the Times, eventually moved the printing plant to Oklahoma City. However, on February 10, 1889, U.S. Army troops from Fort Reno raided the Oklahoma City plant because it was illegal to be in the area. Consequently, the plant was moved to Purcell in Indian Territory, near the southern boundary of the Unassigned Lands. Prior to the enactment of the 1890 Organic Act the area known as No Man's Land (Oklahoma Panhandle) lacked any official government. Ranchers and squatters filtered into the area, and they soon established means of communication through organization of post offices and newspapers. Early papers in No Man's Land included the Beaver City Pioneer begun in 1886, the Territorial Advocate at Beaver in 1887, and the Benton County Banner in 1888. During the territorial period three prominent periodicals made their debut. From 1889 to 1900 Frank McMaster published the McMaster's Oklahoma Magazine in Oklahoma City, Oklahoma Territory. At Muskogee, Indian Territory, the Sams Publishing Company printed the Twin Territories: The Indian Magazine beginning in December 1898. Ora Eddleman Reed, sister-in-law of Walter Sams, the company's owner, served as editor and feature writer. The publication last appeared in May 1904. Missouri journalist O. P. (Oliver Perry) Sturm established and edited the Sturm's Oklahoma Magazine in September 1905 in Tulsa, Indian Territory. In October 1906 Sturm moved the publication to Oklahoma City, and it continued until May 1911. The 1895 Ayer's Newspaper Directory indicated that Indian Territory had forty-one weekly newspapers and one daily paper. Indian Territory had a population of 180,182 in 1890 and 392,060 in 1900. By 1900 Indian Territory had fifty-eight printing firms and printing ranked fourth in importance based on value of products. Five years later the number stood at 153. Printing and publishing ranked third behind flour/grist mills and the cottonseed oil industry. In 1900 companies had $115,003 invested in capital, compared to $455,992 in 1905. According to the 1895 Ayer's Newspaper Directory Oklahoma Territory had 117 weekly and thirteen daily papers. Oklahoma Territory had a population of 78,475 and 398,331 in 1890 and 1900, respectively. 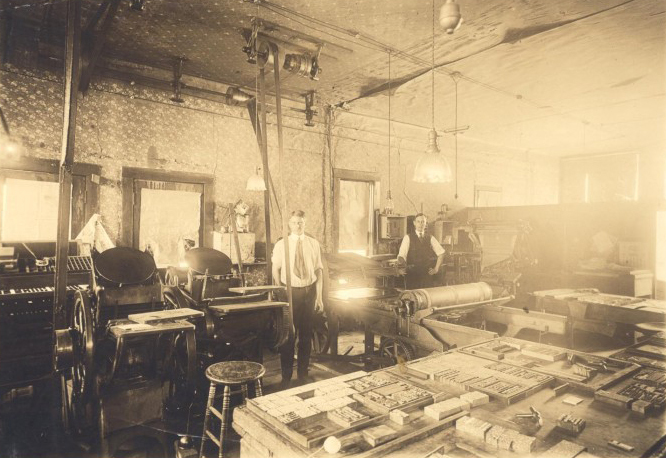 By 1900 Oklahoma Territory had four book and job printing firms and ninety-eight newspaper and periodical printers. Five years later the numbers stood at sixteen book and job printers and 244 newspaper and periodical printers. The publishing industry ranked third behind flour/gristmills and the cottonseed oil industry. Firms in O.T. had $395,108 in capital in 1900 and more than $1.2 million in 1905. In 1909, two years after statehood, the printing and publishing industry ranked first in terms of number of employers, with 598 plants. With 1,008 employees, it was one of the top five industries. When Oklahoma Territory was opened to non-Indian settlers beginning with the first land opening in 1889, newspapers appeared in early communities. Publishers and editors promoted their town's development, thus garnering support for their newspapers. On April 29, 1889, William T. Little of Guthrie published the Guthrie Getup, supposedly the first newspaper to be printed in O.T. after the opening. Like many early newspapers, the Guthrie Getup was short lived. Frank H. Greer, who participated in the 1889 land run, established the Daily State Capital in Guthrie and served as president of the State Capital Printing Company. The Daily State Capital supported Republican politics, and the Guthrie Daily Leader, a Democratic paper, was the official organ of the 1906 Constitutional Convention. During the Territorial Era, the Cooperative Publishing Company, located in Guthrie, served as the official state printer for school textbooks and accomplished job printing and binding for state institutions. In Oklahoma City, brothers Angelo C. and Winfield W. Scott published the Oklahoma Times on May 9, 1889. African American newspapers soon developed with the Oklahoma Guide published at Guthrie in 1889 and the Langston Herald at Langston in 1891. Since the territorial period ethnic newspapers have sporadically served the non–English-speaking immigrants. Through the years specialized periodicals have served Oklahomans. The Baptist Messenger and the Sooner Catholic are among the many religious organs. Game and Fish News, predecessor of Outdoor Oklahoma, first appeared in 1945. Beginning in January 1956 Oklahoma Today promoted the state's scenery and tourist attractions. The Oklahoma Farmer-Stockman, prominent among the farming publications, had its start in Oklahoma City in September 1911. Sporadically, between 1912 and the 1970s a number of magazines and newsletters with Oklahoma Highways in their title have served a wide audience. Harlow's Weekly first appeared on August 17, 1912, after Victor E. Harlow had established the Harlow-Ratliff Printing Company in Oklahoma City. The Petroleum Publishing Company, based in Tulsa, published the Oil and Gas Journal. Women found a niche in Oklahoma's publishing industry. Elva Ferguson, who was married to Territorial Gov. Thompson B. Ferguson, took over the management of the Watonga Republican following her husband's death in 1921. Maude O. Thomas was an early-day publisher for the Beaver Herald. Sibyl Dunn Warden and her husband, Sidney Ray, established a publishing and bookbinding business in Oklahoma City. Among the early women's magazines were The Oklahoma Lady, published by Sallie Sturgeon, and The Oklahoma Woman, with Winonah "Winnie" M. Sanger as associate editor. Mrs. Thompson B. [Elva] Ferguson, They Carried the Torch: The Story of Oklahoma's Pioneer Newspapers (Kansas City, Mo. : Burton Publishing Co., 1937). Carolyn Thomas Foreman, Oklahoma Imprints, 1835–1907: A History of Printing in Oklahoma Before Statehood (Norman: University of Oklahoma Press, 1936). "Printing and Publishing," Vertical File, Research Division, Oklahoma Historical Society, Oklahoma City. Grace E. Ray, Early Oklahoma Newspapers: History and Description of Publications From Earliest Beginnings to 1889 (Norman: University of Oklahoma Bulletin, 1928). Linda D. Wilson, "Printing and Publishing Industry," The Encyclopedia of Oklahoma History and Culture, https://www.okhistory.org/publications/enc/entry.php?entry=PR015.